CCleaner is a popular utility used to clean, repair and optimize Windows in a quick manner. 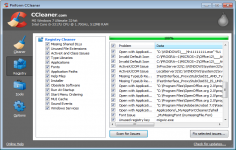 CCleaner is a handy utility for clean, repair and optimize Windows quickly. The software removes unused files from the hard drives, shortcuts with no target, ActiveX controls, help files, the registry entries, etc. to free up space and improve the Windows loads. CCleaner is also able to erase all traces of the web browsing in seconds as it will deal among other historical consultation and navigation , cookies , lists of recently opened documents, forgotten in the Recycle Bin , items copied to the Windows clipboard and temporary files . The program can also delete temporary documents from many applications such as eMule, Kazaa, Google Toolbar, Office, Nero, Adobe Acrobat, WinRAR, etc. He In addition to freeing up space on the hard drive , this device can be used to protect the digital privacy. Regarding the Windows registry, CCleaner will ask you to analyze the search for errors and unnecessary entries threatening the integrity of the "backbone" of the virtual system from Microsoft.